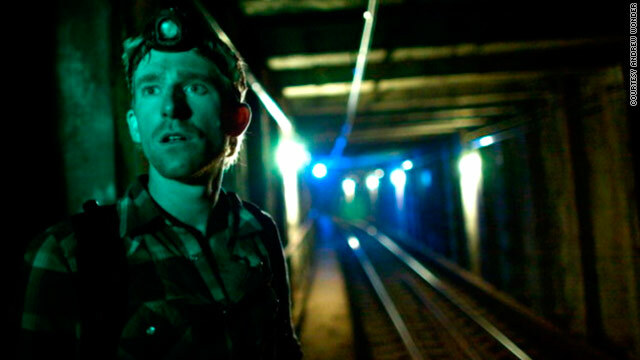 Steve Duncan explores a tunnel in "Undercity"
Subway explorer reveals NYC's "Undercity"
Steve Duncan jokes that he's too old to be running through underground tunnels. But he loves it. He's risking arrest, injury or even death to explore hidden parts of New York's subway system and the people who live in its dank corridors. Duncan's curious obsession is documented in the 28-minute film "Undercity." It's a jolt when the viewer first sees filmmaker Andrew Wonder and Duncan wait momentarily for a quiet, empty subway platform and then jump down onto the rails. Wearing gloves and a backpack and carrying a flashlight, Duncan tells Wonder that the main objective is to avoid getting killed. "It's always a gamble," he says. The duo move swiftly, careful to not be seen. A train screams by, so close it's frightening. They duck so that no one inside the train spies them. If Duncan gets caught, he says, he'll probably face criminal trespassing and reckless endangerment charges. That's unfair, he thinks. The public has a right to see what lies under their city. When he tried to climb Notre Dame in Paris, he tells Wonder, the police arrested him, but they understood why someone would want to explore a beautiful and complex landmark. "But in New York, nobody seems to understand why I want to see these amazing structures," he says. "It kinda makes me sad that there's so much suspicion around just appreciating the city." Another scene is shot at 1 a.m. on a weekday. Duncan waits until he's sure no one is watching and pulls a crowbar from his bookbag. He pries open a manhole and climbs into a sewer beneath Canal Street, what was once an above-ground waterway. Duncan tells Wonder he only wants to show him the entrance, but he can't resist. The urban explorer looks out along the dark tunnel and says there's a brick archway if they walk down 50 feet. They shouldn't go, Duncan says, but he starts walking anyway, ducking under dripping glops of goo he calls "snotsticles." They meet a cast of characters seemingly dreamed up for a novel, including a woman who followed a stray cat into the underground 28 years ago and never left. I heard there's a McDonald's down there. this story sounds very similar to that movie demolition man. i wonder if there is any cutlass 442's buried under newyork? I only have this to say MENTAL ILLNESS IS A SUBWAY! I also heard that love is a battlefield. And there is a "beast" named "Vincent" who falls in love....Hmm wasn't that a television series?